Powers/Abilities: Atomic Rabbit can fly and possesses superstrength and invulnerability. He has to regularly eat Uranium carrot cubes to maintain his powers. He's immensely powerful - when Sly Fox blocked out the sun using a smokescreen, hoping the lack of light would kill off Atomic Rabbit's carrot crop, Atomic Rabbit moved the sun around the smokescreen, rather than finding a simpler/saner solution. History: The rabbit who became Atomic Rabbit was a normal anthropomorphic bunny until, lonely and starving, he ate some Uranium-235 irradiated carrots which temporarily transformed him into a superhuman...er, superleporid who adopted the costumed identity of Atomic Rabbit to protect his fellow creatures from those who would prey on them, usually the villainous former mayor Sly Fox and his two sons. Comments: Created by Al Fago. 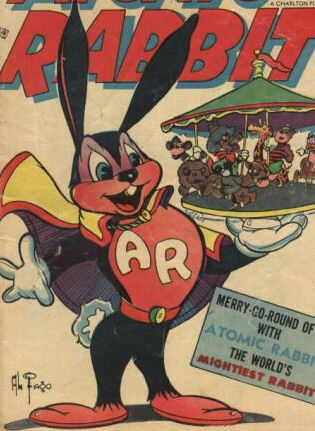 The character changed his name to Atomic Bunny as of the twelfth issue of his series. Unlike many Charlton characters, Atomic Rabbit did not end up sold to DC Comics, but to comic publisher Richard Broughten, who subsequently reprinted some of the character's old stories in 1996's Atomic Rabbit & Friends via Avalon Communications. The "Friends" of the title included Atom the Cat, Atomic Mouse and Superdog. The other rabbits living in the town know of Atomic Rabbit's power source, and (strangely) protect and maintain it, rather than eating the carrots themselves - given that the carrots are radioactive, perhaps the rabbits are afraid that long term usage is hazardous to the health, so Atomic Rabbit is making a sacrifice to be their protector. Atomic Tommy, British hero of the 1940's, given superstrength by an "atomic jacket"